A rail photo by Steve Crise, last year's Third Prize winner. Steve does urban landscape, product, portrait, and set photography as well as stock photography for Corbis with a railroad theme. 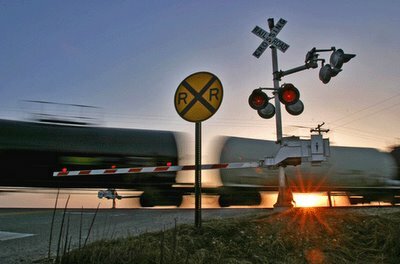 Every year, the Center for Railroad Photography and Art sponsors a contest for railroad photography in order to encourage "outstanding contributions to railroad imagery." The deadline for this year's contest is February 20th; you can download a .pdf entry form from the Center's website. Here's a helpful hint: if you know a railfan photographer who isn't online, download an entry for them!